“As parents ourselves we understand that getting kids to brush their teeth is tantamount in good oral health presently and in the future”, says Dr. Sandberg. As parents, how do we expect kids to do what we say when they don’t see us doing it yourself? Are you brushing for two minutes twice a day? A new public service campaign called “Kids’ Healthy Mouths” urges kids to brush for two minutes twice a day or 2min2x. This is a great campaign but they need your help in making it stick and become a daily routine for them. Have you ever wondered why we should brush for two minutes? Some experts say that it takes two minutes for the tooth enamel to uptake the fluoride in toothpaste, but two minutes even without toothpaste or fluoride is better than nothing at all. In any case, two minutes is a long time when brushing your teeth. 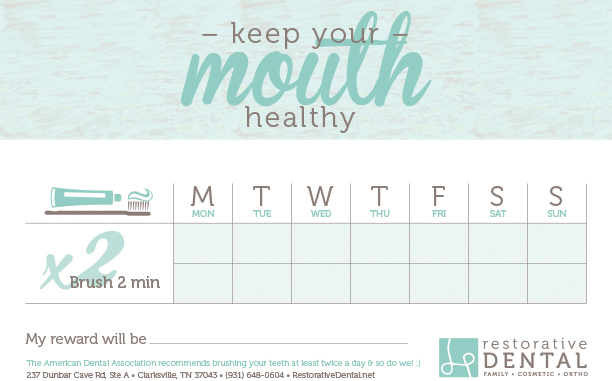 Restorative Dental promotes good oral health and the building block for maintaining strong, healthy teeth begins with brushing thoroughly twice a day. If you’re using an electric toothbrush, you’re probably already accustomed to the two minutes that they’re usually automatically set for. Two minutes for a child can seem like an eternity. One tip many dentists give children to pass the time while brushing their teeth is to hum a song such as “happy birthday”, which must be hummed twice since it is only a minute long. “The staff at Restorative Dental would love to know if you have a favorite song you often hum while brushing your teeth”, expresses Rita, administrative assistant. You can also use a reward method with a weekly chart for the kids to fill in when they’ve brushed for 2 minutes 2 times a day. Kids rapidly respond to the reward method. But leading by example is still important! Even using bribery to get your kids to brush their teeth regularly is secondary compared to the “monkey see, monkey do” theory. Your kids will most likely do whatever they see you doing. So get to brushing for two minutes, twice a day, for your oral health as well as that of your children’s! Here at Restorative Dental, we can show your children the proper way to brush their teeth. If you have any questions or concerns please call our office at (931) 648-0604 or visit our office in Clarksville, TN for your dentistry needs.